Griffiss AFB is located in Rome, Oneida County, New York. It consists of 3,552 acres3,552 acres in the lowlands of the Mohawk River Valley in Rome, Oneida County, New York. . Missions at Griffiss AFB have included fighter interceptors, electronic research, installation, and support activities, aerial refueling, and bombers. Griffiss AFB was designated for realignment under the Base Realignment and Closure Act in March 1993, resulting in the deactivation of the 416th BW and the closure of the base on Sept. 30, 1995. The base was soon renamed Griffiss Business and Technology Park and was open for business. 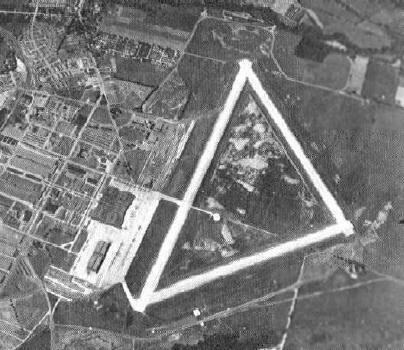 On 3 April 1941, the War Department began looking for an area to construct an Air Depot in central New York. Orders to begin construction came from the War Department on 23 June 1941. By 1 February 1942, Rome Air Depot was activated and had the mission of storage, maintenance, and shipment of equipment to units throughout the United States and the European and African theaters of operation. Rome Air Depot went through numerous name changes and redesignations between 1942 and 1948. In September 1948, the last name change occurred and the base became known as Griffiss Air Force Base (AFB). Although many aircraft landed at Griffiss during the war, it wasn't until October 3, 1950 that the 1st Fighter Interceptor Group became the first permanently assigned flying unit at Griffiss. The unit was reassigned to California just nine months later. The Rome Air Development Center (RADC) was created in June 1951 for research, development and testing of electronic systems for the Air Research and Development Command. Also in 1951, the Rome Air Depot became the Rome Air Force Specialized Depot, responsible for ground communication and electronics. In June 1958, the headquarters of the Ground Electronics Engineering Installation Agency (GEEIA) was formed to engineer and install ground communications equipment throughout the world. The 4727th Air Defense Group, equipped with F-89J came to Griffiss in February 1957. The 49th Fighter Interceptor Squadron replaced the 4727th ADG in October 1959 and converted from the McDonnell F-101 "Voodoo" to the Convair F-106 "Delta darts" in late 1968. The 49th FIS was inactivated at Griffiss AFB on July 1, 1987, when the air defense mission was transferred to the Air National Guard. 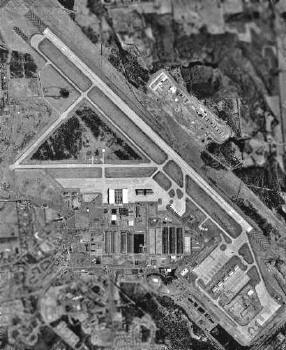 In late 1958, the Rome Air Specialized Depot was redesignated the Rome Air Materiel Area (ROAMA), with the responsibility of managing Air Force communications support programs. In 1964, ROAMA was selected for a phase-out, which was completed three years later. In May 1959, the 465th Fighter Interceptor Squadron was assigned to Griffiss with F-89 Scorpion all-weather fighters. Late the next year, the 49th Fighter Interceptor Squadron assumed operational control over the 465th and became a major tenant at Griffiss. The 49th operated F-101 Voodoos until late 1968, when it was re-equipped with F-106 Delta Darts. The 49th was the last operational unit to fly the F-106s, prior to being deactivated July 1, 1987. GEEIA assumed host responsibilities for Griffiss Jan. 1, 1968. Griffiss AFB traces its name to a Buffalo aviator killed over Europe during World War 2. Townsend E. Griffiss was born in Buffalo, N.Y. on April 4, 1900 and received an appointment to the US Military Academy where he graduated in June 1922. He earned his pilot wings at Brooks and kelly Fields, TX and became an instructor at Brooks until May 1925 when he went to Hawai for duty with the 19th Pursuit Squadron. He returned to California as a first lieutenant in June 1928 for a three-year tour at March Field to be an instructor and commandant of cadets. In September 1933, he transferred to Bolling Field, Washington, D.C. as commanding officer of the Air Corps Detachment. Promoted to Captain in August 1935, he was assigned a three-year overseas tour as assistant military attache for air in France and Spain, and later Germany. He returned home and graduated from the Air Corps Tactical School at Maxwell Field, Al., in May 1939. Later, he went to the War Department and in March 1940 was promoted to Major, then designated a member of a special Army observers group which left for London in May 1941. The group was to investigate the efficiency of foreign aircraft and Griffiss was designing ferry routes for the shipment of aircraft from England to Russia. In November of the same year, he was promoted to Lt.Col. On February 15, 1942, while returning from Russia, the British aircraft with Lt.Col. Griffiss aboard was mistaken for an enemy aircraft and shot down by two Royal Air Force pilots off the southwest coast of England. Griffiss was the first U.S. airman to die in the line of duty in Europe during World War 2. After his death, Busy Park military installation in England was named Camp Griffiss in his honor. On September 20, 1948, Rome Army Air Field was renamed Griffiss AFB in honor of the late Lt.Col. Townsend E. Griffiss. In 1959, the 4039th Strategic Wing was activated with B-52s and KC-135s until replaced in 1963 by the 416th Bombardment Wing. The primary missions of the base could be summarized as deterrence, research, communications and surveillance. The deterrence missions were handled by the 416th Bomb Wing, research was handled by the Rome Laboratory and the communications mission was handled by the 485th Engineering Installation Group, providing programming, engineering and installation support at many bases and in Canada, Greenland, Iceland, the Azores and Europe. Surveillance is the mission for the Northeast Air Defense Sector ( NEADS), responsible for defending a half million square miles of air space including New York City, Washington D.C., Chicago and other majors cities. Air Force Systems Command's Rome Laboratory is the largest engineering laboratory developing 21st century command, control, communications and intelligence technologies and is also located at Griffiss AFB. The base has been home also for the 24th Air Division since September 1983, following a major overhaul of the air defense force structure. Its air defense responsibility was to equip, administer and train combat-ready forces for the northeast United States. In 1987, the 24th Air Division's area of responsibility was expanded as part of a major restructuring of North American air defense and following the inactivation of the 23rd Air Division at Tyndall AFB, the 24th became responsible for the entire eastern United States. The 24th AD was inactivated sept.30, 1990. For a number of years, Griffiss AFB has been home for the 10th Aviation Brigade which first arrived with a handful of people in November 1987. The Brigade was part of the reactivated 10th Mountain Division and remained here until facilities were constructed for the division at Ft. Drum, N.Y. The brigade was flying three types of helicopters; the UH-1 for transport, the AH-1F for attack and the OH-58A for reconnaissance, at the time. The history of the 416th Bomb Wing dates back to the period of rapid expansion of the Army Air Force that followed the United States' entry into World war 2 in late 1941. The 416th Bomb Wing was one of more than 200 air groups created in 1942 and 1943. The Wing was constituted as the 416th Bombardment Group (Light) on Jan.25, 1943 and activated at Will Rogers Field, Ok., on Feb.5, 1943. The Group consisted of four operational flying units; the 668th, 669th, 670th and 671st Bombardment Squadrons. The Group's first aircraft was the twin-engine A-20 "Havoc" and in early 1944, deployed to RAF Wethersfield, England as part of the 9th Air Force. For its accomplishments over France during 1944, the 416th was awarded the Distinguished Unit Citation. Following the surrender of Germany in May 1945, the Group returned to Camp Miles Standish, MA. and was inactivated on Oct.24, 1945. The wing's tankers deployed to Clark AB in the Philippines in December 1964 to provide aerial refueling of tactical combat aircraft operating in Southeast Asia. By July, the wing's tankers and crews began supporting B-52s "Arc light" missions. The wing's first bomber crew deployed to the theater in June 1968. At times during this era, more than half of the wing's B-52 crews were on temporary duty in Southeast Asia. Another milestone in the 416th BW history occurred in July 1970 when the wing assumed host responsibility of Griffiss AFB. The base passed from the Air Force Logistics Command to the Strategic Air Command. The 416th received its first Short Range Attack Missile in November 1972. By June 1973, each of the wing's aircraft had been modified to carry up to 20 missiles on wing pylons and on a rotary launcher in the bomb bay. Congress announced in May 1979 that the 416th BW would be the first wing to receive the Air Launched Cruise Missile (ALCM). The wing received two Air Launched Cruise Missiles on Jan.11, 1981. These missiles were initially used for environmental testing and maintenance training. On Aug.15, 1981, the first B-52G modified to carry the missile was returned to the wing and the first ALCM training flight was launched Sept.15, 1981. On Sept.21, 1982, the wing conducted the first ALCM operational test launch by an operational wing. The 416th received the Air Force Outstanding Unit Award in recognition of its work with the ALCM. In May 1990, the wing began re-engining its KC-135 fleet with High Bypass Turbofan engines. The now designed KC-135R had extended range, increased power, noise reductions and more importantly, could give more fuels to receivers since its new engines were consuming a lot less now. By July 1990, the wing's last KC-135A had undergone the re-engining process, just in time to display its new capabilities in Operations Desert Shield and Storm. The 509th Air Refueling Squadron was formally activated at Griffiss AFB on Sept.20, 1990 with the newest tanker model, the KC-135R. The history of the 509th AREFS began in 1948 at Walker AFB, near Rosewell, N.M., where it flew KB-29s, becoming the first and now oldest air refueling squadron in the Air Force. In 1954, the unit converted to new KC-97s and moved to Pease AFB, NH in 1957. The 509th was assigned to the 509th BW until 1990. In Desert Storm, the wing's B-52s and crews flew 148 combat sorties for more than 11,000 flying hours dropping 6,274 bombs equaling 4,394,350 pounds of ordnance, while the KC-135s flew 1,100 sorties and transferred 100 million pounds of fuel. On May 9,1991, B-52G 58-0225 "Mohawk Valley" piloted by the Wing's Commander, Col.Mike Loughran, landed at Griffiss AFB for the last time to be preserved on base. In July 1991, the 416th BW began converting from the B-52G to the H model. The upgrade was concluded in October 1991 when the wing received its last B-52H. The 416th BW was redesignated the 416th Wing on Sept.1, 1991. Concurrent with the redesignation was a complete restructuring of the wing, eliminating the three deputy commander levels and organizing the wing into a four-group structure; the 416th Operations, 416th Logistics, 416th Support and 416th Medical groups. When the Air Force reorganized June 1, 1992 the 416th Wing became the 416th Bomb Wing and realigned under 9th Air Force, Shaw AFB, S.C. and the Air Combat Command, headquartered at Langley AFB, Va.. The Wing's KC-135R became the responsibility of the 380th Air Refueling Wing, Plattsburgh AFB, NY., under the newly activated Air Mobility Command. The 41st ARS was inactivated on February 15, 1993. The base's final "Commander's Day" was held on Aug.13, 1994 with many neighbouring units attending this final open house. November saw the 416th BW loosing its last B-52H with the aircraft transferring to Minot AFB and the 5th BW. The Wing was officially deactivated in September 1995.